We decided that we wanted to go to Nepal to trek in the mountains too. We chose Annapurna sunrise with an agency we found in the National Geographic tour guide. It wasn’t the hardest trek, and it was perfect for our first trip there. When we exited the airport, my heart broke a little. I knew about the earthquake in 2015, but I had never imagined what this looks like in reality. Most of the buildings were destroyed, there was so much dust and polution in the air, you could barely breathe. 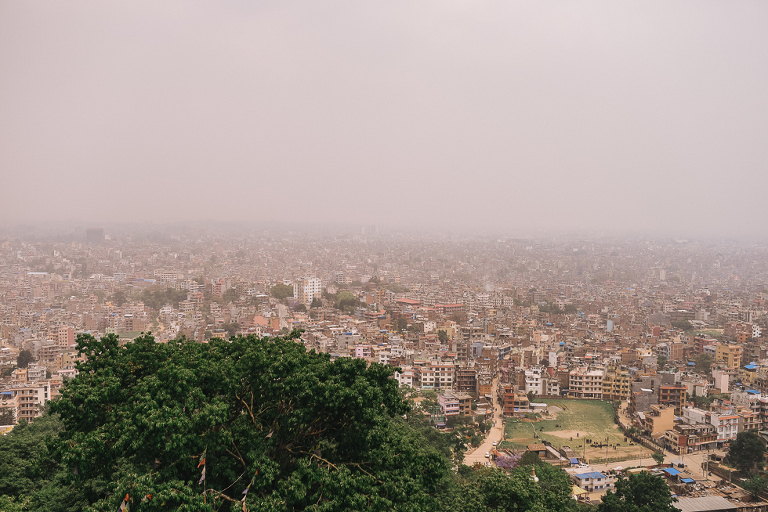 We arrived at our hotel and hurried to get outside so we could head out to visit Kathmandu, the capital. I’d travel in Asia before but this part of it was particularly special. It was so crowded on the streets. Cars, people, motorcycles, horns, cows, you had to be so careful all the time. People were nice. Some of them were very poor, but really kind. I felt safe throughout our time there. We spent 2 days visiting Katmandu before heading to Annapurna where we were supposed to start climbing the mountains. The distance between Katmandu and Annapurna is 200 km and it took us 9 hours to get there by bus. From Annapurna we started climbing up. For 3 days, we climbed and climbed and there were times when I said, “I cannot do it anymore,” and that’s when Mircea was taking my backpack too, poor guy. I have to mention that we didn’t train a lot for the trip, we just ran a few times before. Anyway, I’m not the fittest person, but the trek is still possible even if you don’t go to gym often. The climb was so beautiful! Oh my God, it’s such a peaceful place! We slept in very very modest lodges where you had to pay for the shower. We ate in modest places also, and we loved it. We only ate local food, and drank too much ginger tea. We met a lot of locals, people who actually live at 3000m altitude there and who bring up their food using donkeys. Poor donkeys have to carry everything up there, even construction materials for new lodges or houses. We saw a lot of monkeys, but we didn’t see tigers, thank God :)) We had a really awesome guide who shared with us the background and history of Nepal. He also shared that he had seen a few tigers in his life on other treks. The best moment was the last climb to see the sunrise and one of the highest mountains in the world. We woke up at 4 a.m. and I felt so bad, I could barely get up there. I felt dizzy and sick for a few hours. When we arrived up there everything changed. That was the reason of our trip, and we got there, and I was so happy looking out at the beautiful mountains in front of us. I have tried to travel as much as possible over the past few years but no destination has given me the peace and happiness Nepal did. I left a part of me there and we decided to go back as soon as we can. Hopefully for Everest base camp trek, which is harder and longer and it requires more intensive training. Nepal, I love you so much! Hope you enjoy the photos, you can always contact me if you have questions about the trip. Take a look at this beautiful Provence photo session in the lavender fields, south of France. I have a big dream.. not easy to fulfil, but neither impossible: I want to create memories in every corner of the world 😀 I am not rich at all. I still rent a place to live in. It’s in Paris, I must add :)) I haven’t yet saved a penny. All I have gained was spent on traveling. For me, it has been by far the best choice. I’ve seen places I didn’t dare dreaming of just a few years ago and nobody can ever take away the memories I’ve made; I want to write them in a book when I grow up. :)) It is said that traveling is the only thing you can buy that actually makes you richer. And I am not referring here to luxury travel. You can try traveling on a budget, and I’ve helped many others do this also.